Dancer to aerialist halfway house. Driven by artistic director Vicki Amedume, Upswing are a UK company working mostly in wired aerial theatre, and mostly with dancers or actors who are trained-up to acquire whatever skills are needed for a particular show. Alongside its production work, Upswing carries on a strong line in CPD training, running an apprentice scheme for new African-Caribbean aerialists that also serves to train members for the company. A West African woman is inexplicably taken away from her home. Held against her will in a prison, she is miles from her husband, her child and everything she knows. Punished for her unexplained crimes in an unknown world, this woman is both fallen from her homeland and perceived as fallen in nature. 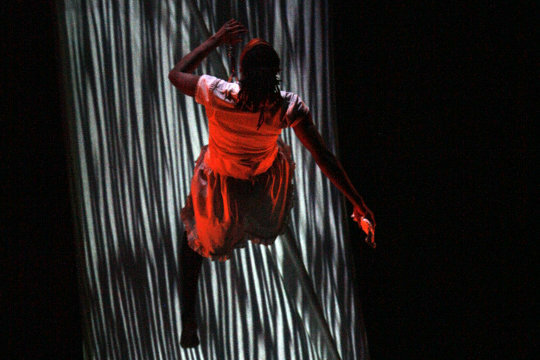 Upswing's artistic director Vicki Amedume talks to Sideshow about her background in traditional circus, her interest in working stories into non-text-based work, the particular problems and quirks of devising circus, and where all these strands meet: the company's new show, Fallen.